Summer School days are a time for maintaining skills and having fun while learning. Title 1 and Tuition Free students board Wicomico County school buses early in the morning and arrive at Glen Avenue School and Chipman First Grade Center in time for a nutritious breakfast. At 8:30 A.M. classes begin. Students in grades 1-6 are given four hours of instruction in math, reading and writing. 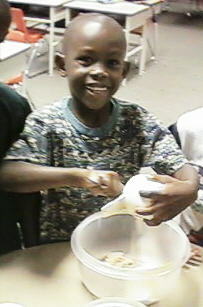 Summer school teachers use materials and techniques that encourage hands-on activities and small group situations. Math lessons include real world applications. Students have fun cooking from recipes, calculating time across the various time zones, reading maps, and hearing Salisbury mounted police tell how they can calculate the speed of a car from skid marks. 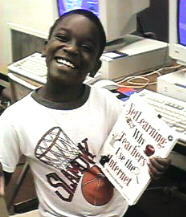 Reading lessons utilize strategies to develop interest in reading for information and fun. Teachers use tools that provide a variety of interest and reinforce basic and advanced skills. Summer school students enjoy writing stories, seeing videos that match books and stories they have read. E-mail messages arrive for the students via Internet from Sri Lanka, Russia, Portugal Antarctica and The United Kingdom. 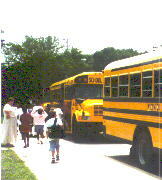 Lunch is served and by 12:30 P.M. students are on their way home again. The Shorebirds Visit Summer School! Linda Eberling Grade 1 - Fifteen Books So Far! Audrey Jones Grade 1 - "Early Success Program"
Debbie Krauss Grade 1 - They Brought the Shorebirds! Martha Swain Grade 2 - Six Months Until Christmas! Mary Stanley Grade 3 - Lemonade! Lemonade! Horsing Around in Summer School We're on TV! Jennifer Hayward Grade 4 - What Time is it in Sri Lanka? Roxy Dennis Grade 6 - Real, Live Actors! In December after they returned from Antarctica, Dave Hess and Matt Nelson came to Delmar Elementary School and met some of the Summer School students. It was a touching afternoon for all! Markis and Shekita are famous! 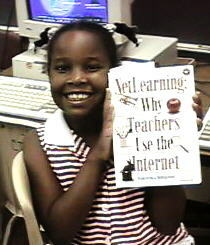 Summer school students, Markis and Shekita, hold a copy of NetLearning: Why Teachers Use the Internet which features their photo on page 179. While in second grade at Delmar Elementary School Markis and Shekita participated in an on-line project with young friends in Japan. Their photo from our Global Classroom homepage is featured in this new book about the Internet by Ferdi Serim and Melissa Koch. Congratulations, Markis and Shekita! We are proud of you.